When people get a new drone, they often forget about drone insurance. In fact, many people don’t even know that it’s an option. And while it may seem odd to buy insurance for your new toy, drones are more than mere toys to serious fliers. More importantly, there are serious benefits that come with drone insurance policies, particularly drone liability coverage. Let’s discuss some basic information regarding drone insurance. First off, insurance is not required for recreational drone use. So if you’re just a hobbyist who flies your drone around your yard or captures photographs, you technically don’t need insurance for drones. Especially since many drones fall under the $100 price, many drones are just flown for fun. However, it’s important to evaluate your own comfort level with risks that come with drones when deciding whether or not to invest in a drone insurance policy. It’s important to understand that your home insurance policy may not cover the damage costs if your drone crashes, violates another person’s privacy rights, or injures a third party. Since these UAVs are considered a “small aircraft” by the Federal Aviation Administration, insurers have the option to exclude drone coverage. Additionally, if you experience theft or total loss, this will not be covered by regular insurance. All of these risks are valid concerns. When using a UAV, it’s completely possible to hit electric lines, harm other people, or damage personal property. Unfortunately, accidents and malfunctions do happen. That’s why investing in UAV insurance could be extremely beneficial. If you decide to invest in insurance for drones, it’s important to be clear with the insurance company regarding your drone use. Insurance for drones is a new area for insurance agents, and therefore they will most likely want as much information as possible about your drone use. In order to make things easier for both you and the insurance company, you should be able to answer the following questions. Will the drone be used for business or personal use? Will it be used in competition? Who will be flying the drone? What is the value of the drone? What kind of drone training do you have? So even if you’re just flying your drone around for fun, a small accident can end up costing you big time if there are any sort of damages or injuries involved. 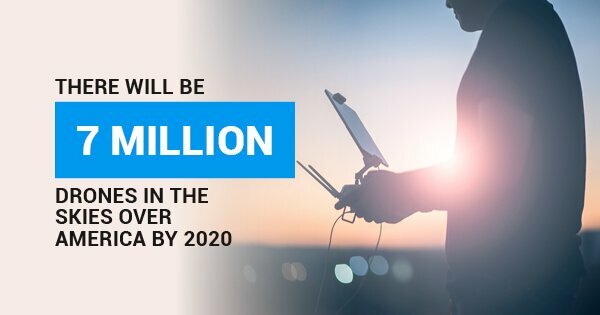 According to the Federal Aviation Administration, the number of drones sold in the U.S. is expected to increase from 2.5 million in 2016 to 7 million in 2020. With the increasing numbers of drones in the skies, there is expected to be an increase in drone insurance policies. However, there aren’t many insurance providers offering drone insurance right now, which is why it’s important to work with aviation insurance brokers. Remember: Insurance for drones is inexpensive and convenient to get, so it’s always a good idea to ensure your drone is covered. Ready to purchase liability coverage and insurance for your drone? Then contact the experienced aviation insurance experts at Bill White Insurance today.